For the fourth time during this trip, a mighty northwest gale carried me down the highway and I racked up some impressive mileage, flirting with a century day. Cleary no ill effects from yesterday’s extended, beat-the-thunderstorm effort. It took a little more than an hour to get from from my motel down to the state border. Along the way, there were scattered branches lying about in front yards and on one occasion, a tree sprawled on the highway. Proof of the power of last night’s storm. I’m quite fortunate to have escaped the festivities. Crossing into my home state of Iowa after five weeks of unending effort provided a high that lasted the rest of the morning. To think I’d actually ridden a bicycle all the way from Seattle! At about the same time, that welcoming wind kicked in and I began cranking. My new road, Highway 9, is more eclectic than the others I’ve ridden on, varying from scattered tiny clumps of red gravel to a sleek, just-finished surface. On the latter, I glided along like an Indy 500 race car. My original goal, the town of Sibley, appeared around noon but there was no way I was going to call it a day at that point. One thing I have learned from this cycling expedition is that when you are on a wind-aided roll, push it for there’s no telling what tomorrow will bring. I continued on towards the Iowa Lakes region, some thirty miles away. Spirit Lake is the name of both a municipality and a body of water. With an additional pair of nearby lakes (East and West Okoboji) the area is a popular summertime retreat, but the tourists had of course long since departed, giving the town that slightly sad, empty, off-season feel. Yet to my surprise, the Super 8 Motel I checked into only had a couple rooms available because of an antique auto convention taking place nearby. It certainly made for an interesting parking lot. Being back on my home turf made me aware for the first time at how the season had changed. Less daylight for my customary after-dinner stroll, and the evening’s cold had an edge to it. Looks like I’m going to win my race against this advisary. I got a real thrill tonight seeing the Doppler Radar on the weather report. Just three counties over was my final destination: Forest City! No longer a distant goal far beyond the horizon, it was now within range thanks to the phenomenal day I had put in. Tomorrow I will be packing up my faithful bike for maybe the final time. One more long haul. Riding through Rock Rapids in the early afternoon, I passed by a church where a wedding was just finishing. Caught a glimpse of the happy bride and groom accepting congratulations from everyone. Yet I found myself, strangely, feeling sorry for them. Northwest Iowa strikes me has a rather secluded, lonely place and it was hard to imagine any kind of future there for two young people starting out on their life’s journey. If given the choice, I’d always opt for cycling in chilly weather, avoiding the heat, but this morning for the first time in my trip it was unpleasantly cold. I bundled up like a cross country skier; the mittens didn’t come off until almost lunchtime. The low temperatures, combined with the recent demanding rides, made it hard to establish any kind of pace. I struggled through most of the day. But why worry if my tank was near empty? This was the final time I’d have to be putting out this kind of effort. Lunch was in a charming small town called Swea City, where I read the local paper looking for references to people I might know. Continuing to toil into the early afternoon, I took two extended breaks to insure that in my eagerness to finish I did not overexert myself. I stopped at a convenience store in Buffalo Center to get directions to the Gruis Golf Course where my dad, brothers and I had played many a round. This required me to pedal into the annoying south wind that had been blowing across my flank all day and my speed slowed to a barely detectable crawl. When I finally rolled into the parking lot, thrilled to at last be in a place I knew, the club house was deserted and the only public phone did not work. Alas, still alone. The final fourteen miles were an agony with hill after hill coming at me like breakers on a beach. It was an entirely new perspective on the rolling topography of Northern Iowa. Until now, the country road I was laboring on had simply been the quickest way to get to the golf course in the family SUV. Now I saw it as a malevolent entity out to sap my will to continue. My home town slowly, grudgingly, came into view. The light blue water tower; the high school; tops of a few downtown buildings. Each time I crested a hill — using the bare minimum amount of any stand-up, hard pedaling — more were revealed. Entering the town, half exhausted, was like breaking through a barrier. I still had a couple miles to go and was contemplating how to best get to my parent’s home when another cyclist came up behind me. After what I’d just finished enduring, I didn’t feel much like talking, but gradually warmed to the task. We compared bikes and discussed trips we had taken. (Not wanting to get into the details of my little voyage, I told him I was doing a tour of the northern part of the state.) He was breaking in a Trek 5200 model. I envied the bike’s special shocks and, of course, the lack of cumbersome traveling gear. Talking with him made the final mile home go much easier. We cycled through town and parted company at the local Pamida on the northeast edge as he continued on Highway 9. The pay phones at the store were both out of order, so one of the clerks let me use the one at the Merchandise Return Desk to call home. I wanted to let the parents know I was just minutes away. As an early celebration, I went to the beverage aisle and selected a grape Shasta pop, but when I tried to pay for it, the cash registers were also on the fritz. (This was the kind of day when petty irritations abounded. Good thing I’d decided beforehand to remain calm.) I asked the checkout girl what she thought the price of the pop might be. Maybe a dollar. I left a dollar fifty, just to be sure. The sun peeking between a fluffy line of clouds. A few trees starting to turn. Blurred reds and browns. A dry, crackly cornfield, its army of tassels marching down towards an antebellum-style house. Ahead of me, the familiar, ruler-straight avenue leading home. For a brief, unforgettable moment, I was king of all I surveyed. I pushed off, coasting down the quarter-mile-long hill, stopping at the ‘T’ intersection at the bottom. Then past the dark, brooding East Woods Park on the right which gave way to the city golf course, surprisingly lush and green under the autumn rays. Turned left just before the sturdy steel mailbox that was older than me. Glided down the rock driveway and up onto the concrete that fronts the garage. Hi mom! Hi dad! I’m home! While my parents were obviously glad to see me, there weren’t many questions about my five week journey. It was not something they could relate to. While I was on my ride, my mother’s main concern was having a rescue plan in place in the event something catastrophic happened to me. And though dad had been tracking my progress with notations on his Rand-McNally map, once I’d safely arrived his focus quickly turned to the Major Fall Project: raking and burning the millions of leaves soon to be falling from the mini forest in the front yard. We did at least go out for a celebratory dinner once I’d unpacked the bike and got myself cleaned up, but since then it has been like all my other rather mundane visits of recent years. I have taken up my usual duties as chef and errand boy, spending one afternoon making a crockpot full of chili (something I’d been hankering for). I also did some of the driving when dad went to the V.A. Hospital down in Des Moines. Afterwards we made a stop at the world famous Prairie Meadows Racetrack to play the slot machines, a kind of family tradition whenever we are in the capital city. I had my usual miserable luck, but any lingering annoyance was soon erased by the warm glow of my completed bike adventure. The reason for dad’s visit to the V.A. 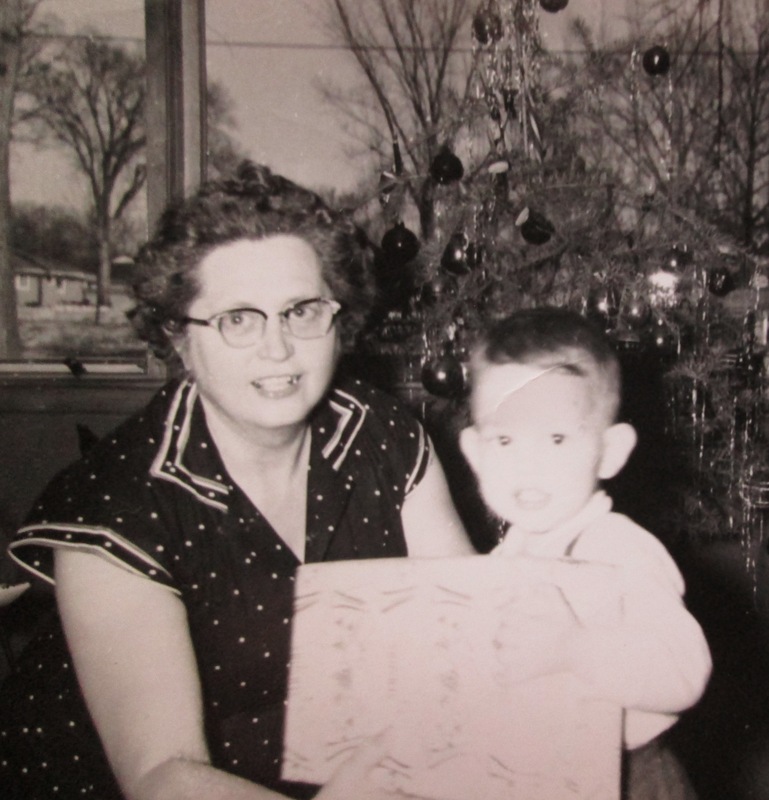 are the memory troubles that have become noticeable the past few years (both he and mom are in their early seventies). He often loses the thread of conversations and cannot recall recent events. The family is concerned this might signal the onset of Alzheimer’s, but there’s no way of testing for it outside of an autopsy. The V.A.’s initial prognosis, pending the blood work, is that there’s nothing wrong with him; he just needs to be eating more. Not sure how confident I am in that. Our parents’ home care is a worry as well. About a decade ago, only a few months after dad’s early retirement, mom developed problems with the nerves in one of her feet (neuropathy) that forced her to start using a cain. Her mobility has continued to decline and it’s now a real effort just to get around the house. Any serious cooking is too much and with dad not knowing his way around the kitchen, they are eating a lot of less-than-healthy processed foods along with Meals On Wheels. Obviously both of them are going to be needing more specialized help. It’s just a question of how soon. Special Note: In less than five years, both my parents would be dead. My mother from a heart attack and Type 2 Diabetes, and dad from dementia complications probably coupled with the grief over his wife’s passing. I really had no heart for this final stage of the trip. The idea of dragging myself out of bed once more to put in even a moderate day’s worth of cycling had no appeal whatsoever. Those last three days of intense peddling as I eagerly hurried home must have really drained me. But there was no avoiding my responsibility. My grandma Bea’s ninety-fifth birthday is tomorrow. Making it there for that, on my bike, has been one of the major goals. It has helped keep me focused, and now that I’ve come this far there was absolutely no way I was going to wait and ride down with mom and dad in a couple days for the official party. It almost goes without saying that the you-know-what was in my face for this, my final long ride. But the day was sunny and agreeable and I was not weighted down with camping gear or excess clothing. I kept myself entertained by counting the number of baby garter snakes I saw on the gravel shoulder, sun bathing. I got up to eleven. U.S. Highway 69 is a busy route, so once south of Belmond I switched to a county road that took me over to Lake Cornelia, site of a few family picnics growing up. I had a short lunch at the park there while fighting off a swarm of ladybugs. Maybe they were hungry? I then got back on the bike, put my head down, and finished the few remaining miles into Clarion. The only motel in town — The Ironman Inn — was on the main highway and easy to find. The owner (Brad) had moved to Iowa after a stint in North Dakota. Claims that he loves the winters here, which makes me think they must be truly horrible up north. Was kind enough to give me a double on the ground floor at a single room rate. My grandmother is now in a nursing home on the south side of Clarion and after I’d gotten settled in, I wasted no time riding down to visit her. With her age and predictable forgetfulness, it’s hard to have a coherent conversation, but she was in good spirits and recognized me. For my first bicycle back in the second grade, she had tied a string onto the right handlebar so I’d know what side of the street to stay on and I joked with her about that, pointing out that I had actually ridden all the way from Seattle, stringless. As always, she was less interested in the details of my latest adventure than whether or not I now had a girlfriend. I gave her the usual encouraging, though not quite accurate, report. We talked a while longer about anything that came to her mind, then I left after promising to be back tomorrow for her special day. Because my family all came from this general area, revisiting the old haunts of my childhood involve little more than a day’s worth of casual cycling — as least for someone in the shape I was in. What a treat this was going to be! The next destination was my grandparent’s farm three miles away, once the site of a welcoming country house whose bedrooms and porches would be filled each summer with swarms of high-spirited grandchildren. 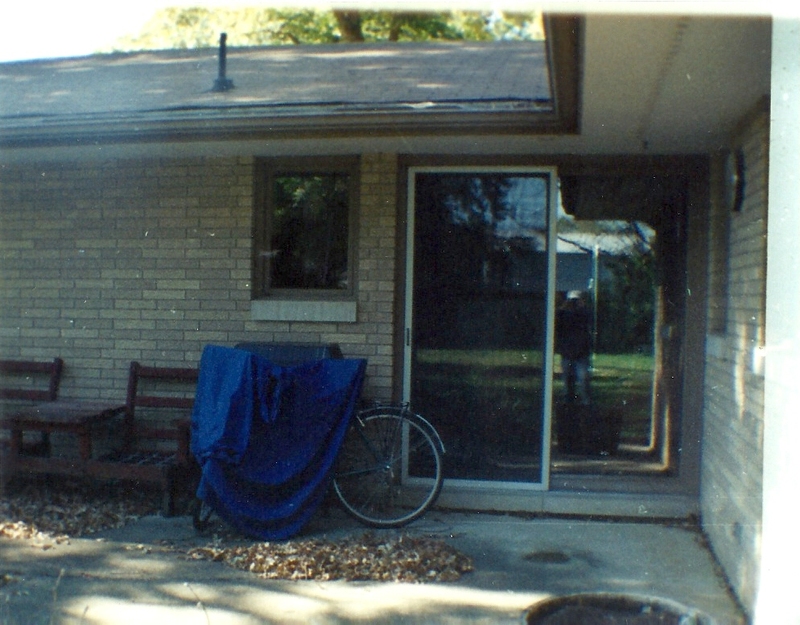 When my family moved away from the area, I had just gotten old enough to ride the three miles from my place to grandpa and grandma’s on my black Schwinn bike, an accomplishment I was very proud of. Now, some thirty-seven years later, I decided to retrace that route. It was no problem remembering it. All I had to do was coast down to the corner, take a right and head west until I saw a skyline of mulberry trees fronted by white buildings. Except that the trees were no longer there. Nor were the buildings. When the acreage had been sold a few years back, everything had been torn down, uprooted and leveled. I’d known this had happened, but it still was a minor shock to arrive at the end of the old driveway only to be greeted by a dusty bean field overrun with dying weeds. As a challenge, I tried to visualize where the house and the old barn had been, and a few related memories trickled back. Since today would have been my grandparent’s seventy-fifth wedding anniversary, I silently wished them well, then continued on. My mother’s parents (Grandma Bea and Grandpa Morse) had lived in the community of Eagle Grove about six miles to the northwest. I began a zigzag route in that direction in order to get on a blacktopped road that connects with the southeast corner of town. This allowed me a leisurely ride down main street and then a block south to my grandparent’s former home, which unlike the bulldozed homesteads I’d stopped at, was still in one piece. I don’t know who’s living there now, but two of the evergreens Morse had planted are still standing tall next to the garage. A childhood friend named Jimmy Christ had lived just across the street. With only three cousins on my mother’s side of the family, he became a regular playmate whenever I was staying “in town”, as my Grandma Bea would put it. We’ve remained in touch through the years and whenever I come to Eagle Grove, I make it a point of stopping by his furniture store downtown to say hello. While he and his wife Gale always enjoy my surprise appearances, showing up on a bicycle this time was arguably one of the last things they expected from me. As I explained the journey I had taken from Seattle, Gale remarked that I was indeed an ambitious person. How true! Since I needed to get back on the road, we didn’t have a whole lot of time to chat, so we promised to get together at a later date. I now had to navigate the seven miles back to Clarion. But I had not been keeping track of the time and when I left Jim’s store, there wasn’t much daylight remaining. Nor had I thought to bring my flashlight and yellow jacket with me. Then to top things off, I stared having trouble with the bicycle lights — one of the damn wires must have come loose. This all led to a hair-raising excursion through the rural darkness. The front light occasionally worked, but the back went out for good, making me near invisible for any drivers coming up from behind. I had to keep a constant watch in the mirror for the distant lights of vehicles so I could quickly find a spot to pull over before I got run over. These days I have to watch myself. I start thinking of “The Trip”, and suddenly my mind is flooded with images. The towering Rockies east of Butte, the rolling Black Hills of Northeast Wyoming and, hauntingly, the windswept loneliness of South Dakota. There was one final ride for me and my hardy Sequoia bicycle, this one to Pilot Knob State Park east of town. There’s a four mile paved trail that starts north of our house (near the Pamida) and runs along the shoulder of Highway 9 out to the park turnoff. Another short mile brings you to the entrance. Not the least bit winded after those short jaunts, I followed a twisting road up “the knob”, stopping a couple times to take in the late fall colors. For November, the day was unusually warm. There’s a forty foot tower situated at the high point of the park, the top of which offers a panoramic view of the countryside. Although Iowa lacks majestic mountains or raging rivers, one can still take in the groves of graceful wind turbines, skeletal water towers and mighty grain elevators that dot the landscape. For me it was both familiar and comforting. Now, one might think that having ridden a bicycle halfway across the country, I’d be ready to return to my job and settle down. But with my furniture still in storage and bank account not yet drained, I might as well attempt another adventure. What should it be? Well, I’ve always wanted to improve my clumsy Japanese. When I worked in Kobe a decade ago, I could not devote enough time to it. So, I’ve enrolled in a language school south of Nagoya and will begin classes the first week of January. It will be three, maybe six months of intense study. I might also do some IT job hunting while I’m there, though at my age (forty-five) I’d be considered a bit long in the tooth. However it turns out, it will be exciting to be back in that country again. I wrapped myself in a warm cocoon of blankets and sipped hot cocoa. Watching my fellow travelers on their fiery journeys.